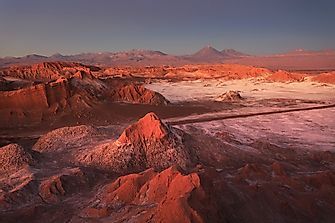 The African continent has jungles, deserts, coastlines, grasslands, and much more that are teeming with unique fauna of all kinds. 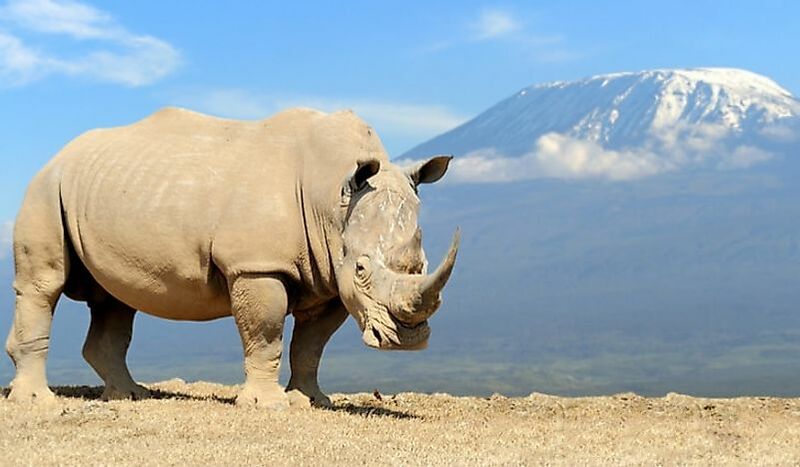 An African white rhino with Mount Kilimanjaro in the background. Africa is endowed with an varied array of wild animals. 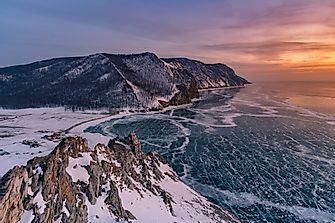 For each ecological setting therein, there are wild animals to match, and habitats within which to sustain them. Some of these wild animals are classified as "endangered", while others are more populous, and, therefore, of "least concern". No matter the sizes of their respective populations, they each contribute to the biodiversity balance within and across their respective African territories. The giraffe is the world’s tallest animal, and well known for its long legs and neck. From head to toe, a mature giraffe’s height is from 14 to 19 feet, and the animal weighs from 1,750 to 2,800 pounds, according to National Geographic (NG). It has a brown mane on the neck, and its head has two hairy horns. The giraffe’s coat has brown patches stained with black, which are separated by a beige coloration. It’s herbivorous, and feeds on leaves, tree buds, and shoots from trees like the Acacia, and other thorny plants and grasses in smaller quantities. The giraffe is found in such African countries as Kenya, Cameroon, Chad, Niger, Uganda, South Africa, Namibia, and Botswana. These countries have wild grassland plains, woodlands, and the savannas which are suited for them. 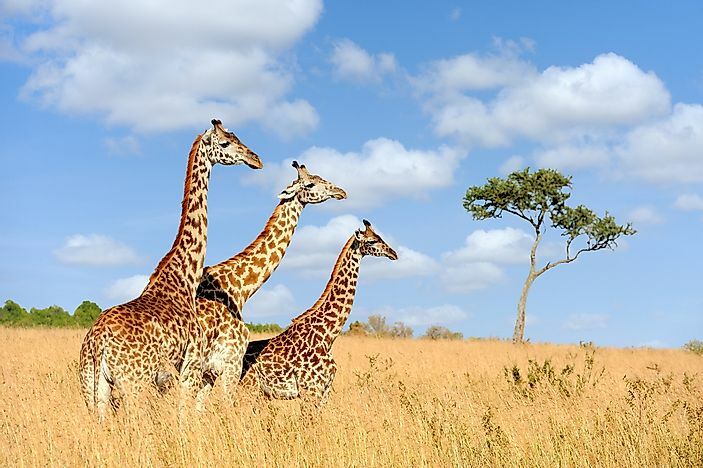 A giraffe is social, and females live in groups of 10 to 12 animals. When happy, giraffes will gallop and engage in playful behavior. A male reaches sexual maturity at 7 years, and a female at 4 years. Their average lifespan is 25 years. According to Giraffe Conservation Foundation, less than 80,000 giraffes remain globally. After the elephant and the rhino, the hippopotamus is the world’s third largest land mammal. At full maturity, it weighs from 5,000 to 8,000 pounds. The hippo’s length from head to rump is 9.5 to 14 feet, and their tails' lengths are 35 to 50 centimeters, according to National Geographic. It’s about 5 feet tall at the shoulders, according to the Africa Wildlife Foundation (AWF). There are two species, and both are found in Africa. These are the Large and the Pygmy hippo. The Large hippo is found to the south of the Sahara in East Africa, while the Pygmy species lives in West Africa. Its preferred habitat is swamps, lakes, and rivers, where they may remain submerged for up to 16 hours, according to National Geographic. The hippo is herbivorous, and feeds on grasses, reeds, and plant shoots. Its skin is hairless and dark brown to grayish-black in color, and the underbelly is pink. 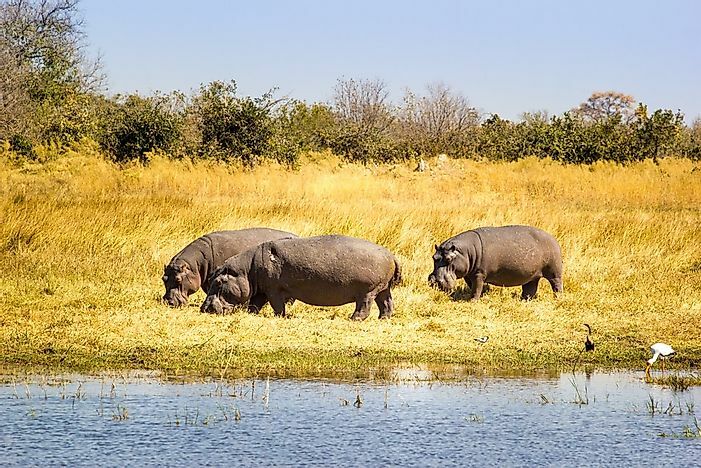 The hippo skin secretes an oily red substance that acts as a sun block, moisturizer, and anti-germ protection mechanism. Hippos are social, and live in groups of 20 to 100. During the day, the hippo is sedentary, but at dusk it leaves the water to graze. In 5 to 6 years, females achieve sexual maturity. The hippo average lifespan in the wild, according to National Geographic, is 40 years. The wildebeest is an herbivorous mammal belonging to the antelope family. It has an unruly dark mane on its upper and lower neck, and sharp, upward curving, black horns. Its coat is light brown with specks of black color. The wildebeest's height is 4.5 feet, and its length to the rump 8 feet, and it weighs up to 600 pounds, according to National Geographic. 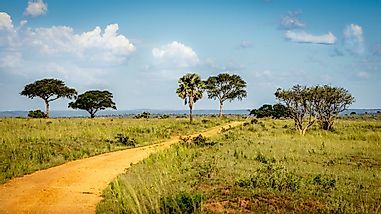 Its habitat is the grassy plains and open woodlands found in central, southern, and eastern Africa, such as those found in the Serengeti and Masai Mara game reserves. Wildebeests are social animals that huddle and travel in herds, and are active both day and night, all the while grazing constantly. Sexual maturity for females begins at 1.5 to 2.5 years, and for male wildebeest at 3 to 4 years. In the wild, their average lifespans are up to 20 years, according to National Geographic. 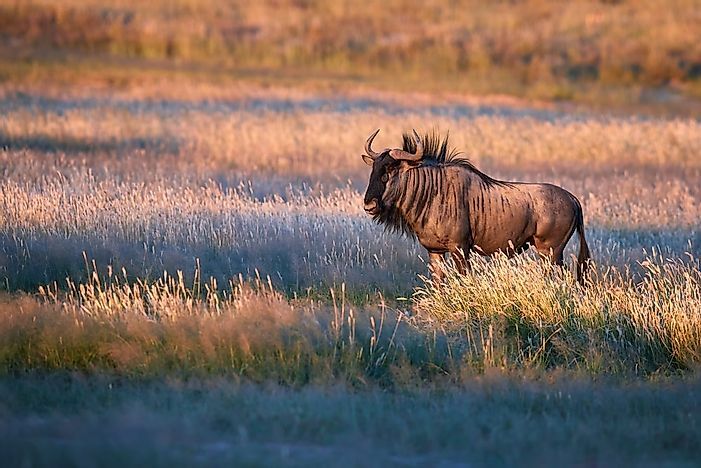 Wildebeests are preyed upon by lions, cheetahs, hyenas, hunting dogs, and crocodiles, and are especially susceptible to these while crossing rivers like the Mara River migrating into the Serengeti. The lemur is a primate with a long, bushy, black and white ringed tail. It has a dog-like snout, nose, and lips, its eyelids are dark, and its furred ears are white. The Lemur’s thick fur is grayish-brown on the back, and grey on the limbs and rump. Its underside has a mixture of white, grey, and cream colors, according to ARKive Initiative (AI). The lemur’s face is white, and the eyes are surrounded by dark patches, and the upper part of the forelimbs have grayish-white fur, while the paws and feet are dark. It weighs 5 to 5.7 pounds. 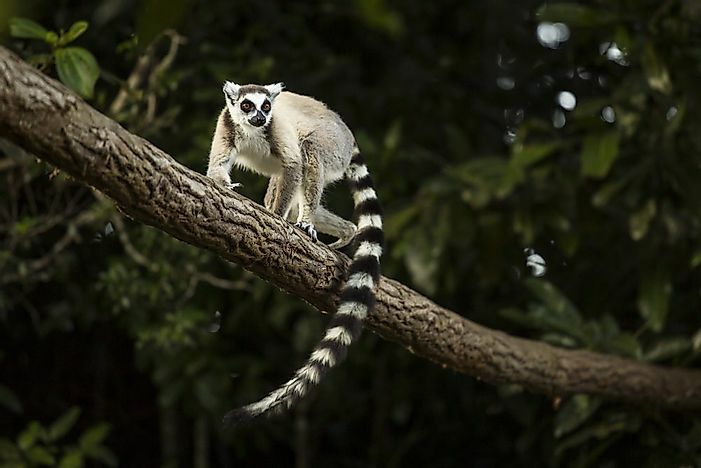 The lemur’s tail length is 55 centimeters, and its head and body length is 8.5 to 45.5 centimeters, according to National Geographic. 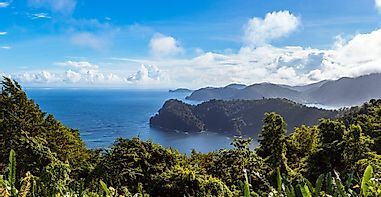 It’s found in Madagascar’s spiny forests, lowland gallery forests, dry deciduous forests, rainforests, rocky canyons, and dry scrub lands, according to ARKive Initiative. In these habitats, it feeds on fruits, leaves, flowers, stems, spiders, caterpillars, cicadas, insect cocoons, birds, chameleons, and grasshoppers. Lemurs live in troops that can comprise of 6 to 30 of them each. They are ferocious in protecting their territory, and use their odor as a defense mechanism. Sexual maturity for a lemur starts at 2.5 to 3 years of age. In the wild, a lemur can live on average 18 years, according to National Geographic. The African elephant is the largest land animal on earth, with two subspecies. These are the Forest and the Savanna African elephants. Its height to shoulder height ranges from 8.2 to 13 feet, and weighs 5,000 to 14,000 pounds, according to National Geographic. The African elephant's length from head to rump is 19 to 24 feet, according to World Wide Fund for Nature (WWF). Its wrinkled coat is gray in color, and is covered with sparse fur. The African elephant has a trunk to smell, breath, drink water, and grab objects like food. African elephant populations lie to the south of the Sahara Desert in the Eastern, Central, Southern, and Western Africa countries like Kenya, Guinea, Niger, South Africa, Tanzania, Uganda, Zimbabwe, and others. 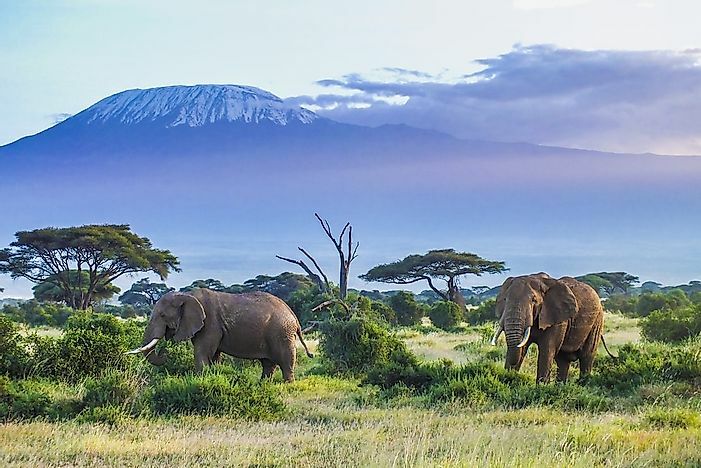 Habitats suited for African elephants are the grasslands and acacia savanna, miombo woodlands, and forested regions, wherein they feed on up to 300 pounds of foods like roots, grasses, fruit, tree barks, and leaves daily, according to National Geographic. The African elephant lives in herds of around 10, comprising of males and females separately. At times, several family units join to form a clan of around 70 elephants, each led by a female, according to World Wide Fund for Nature. African elephants achieve sexual maturity at 10 to 12 years, according to Animal Diversity (AD). In the wild, they have an average lifespan of up to 70 years, according to National Geographic. The zebra is a herbivorous mammal known for its black and white stripes all over its body. Its height to the shoulder is 3.5 to 5 feet, and weighs from 440 to 990 pounds. 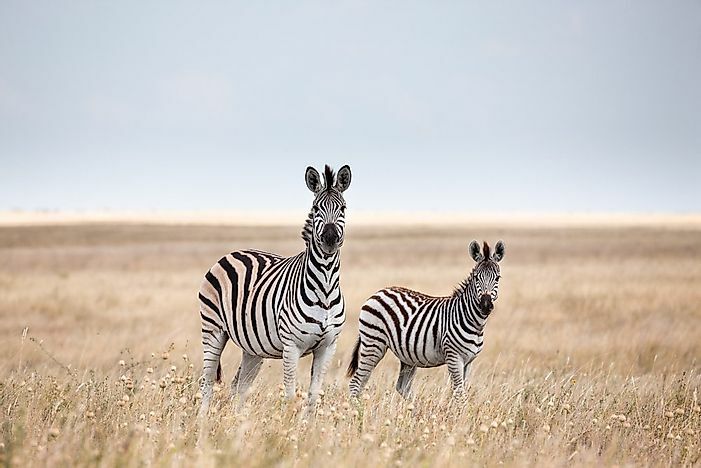 East and Southern Africa is where zebra populations are spread out in countries like Kenya, Tanzania, Uganda, Rwanda, Ethiopia, Namibia, Angola, and South Africa, according to Africa Wildlife Foundation. These countries have treeless grasslands and savanna woodlands habitats with grasses, shrubs, herbs, twigs, leaves, and bark for zebras to feed on. Zebras are social animals that live in harems comprising of one stallion and up to six female zebras plus their young ones according to Defenders of Wildlife (DOW). At times, they come together and form harems of up to 30 members. A zebra sleeps standing up, and will bark to warn others of danger. A female zebra achieves sexual maturity at 2 years, and a male at 3 years. In the wild, a zebra can live on average 25 years, according to National Geographic. Its predators are lions, cheetahs, hyenas, hunting dogs, and humans. The western green mamba is a glossy green snake whose underbelly is a light, bright green. Its average length is 6 feet, and the longest ever recorded was 12 feet. According to the International Union for the Conservation of Nature (IUCN), the western green mamba is native to Benin, Gambia, Guinea, Guinea-Bissau, Senegal, Sierra Leone, and Togo. 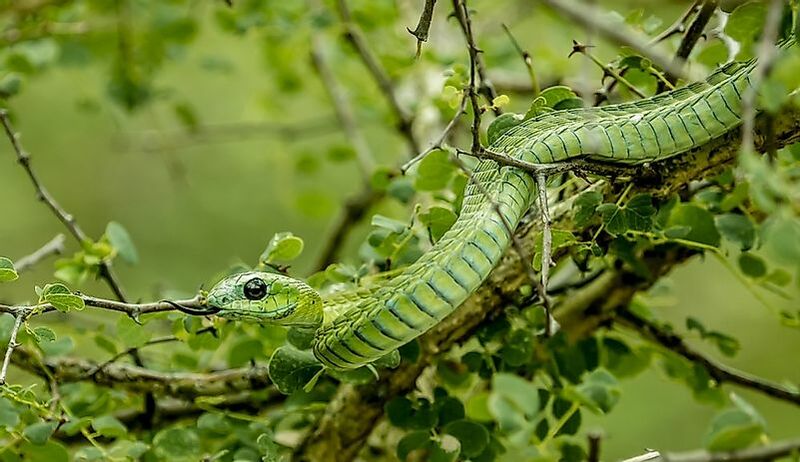 In these countries, the western green mamba lives in humid forests where rainfall exceeds 1,500 millimeters annually, but in Togo its habitat range includes drier open forests in the north, the Guinea savanna in the west, and the littoral lake zones as well. 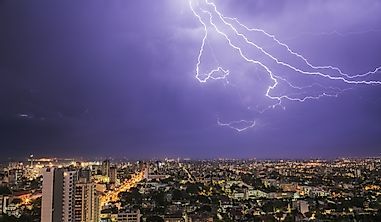 In this environment it primarily feeds on rodents, as well as birds, lizards, and bats, according to the International Union for the Conservation of Nature. The western green mamba lives on abandoned termite and animal burrows, and in rocky terrains and sparse brush. 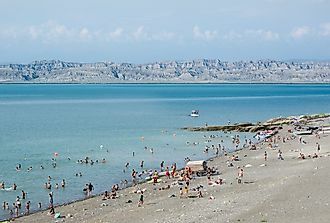 It’s nocturnal where its populations are large. If cornered, the western green mamba hisses, and strikes the enemy with whitish venom that affects respiration and heart rate. It can achieve speeds of 7 miles per hour if running from predators. Western green mambas lead a solitary lifestyle, and males finds a female mate in spring by tracking their scent trails, according to a Jacksonville Zoo report. Sexual maturity begins by at least 18 months, and the snake has a lifespan of 12 to 20 years in captivity, according to Reptiles Magazine. After the elephant, the "near threatened" white rhinoceros is the second largest land mammal in the world. Its skin color is grayish-brown, though the first name suggests it’s white. At full maturity, the white rhino’s length from head to rump is 3.4 to 4.2 meters, and the tail’s length is 50 to 70 centimeters, according to National Geographic. 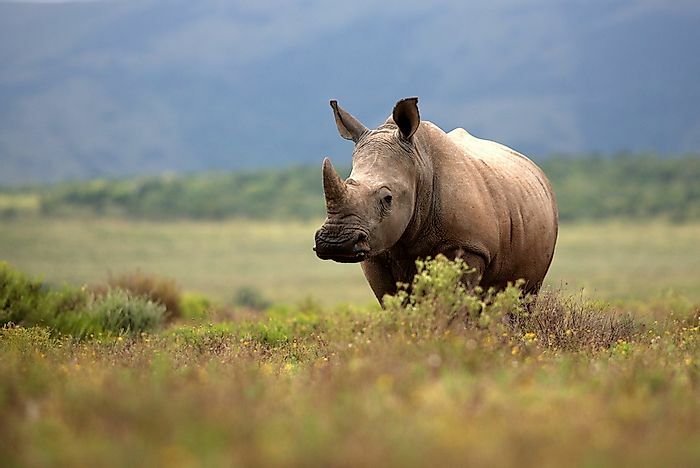 The white rhinoceros’ height to the shoulder can reach 1.85 meters, according to World Wide Fund for Nature, and the front horns can be 60 to 150 centimeters long. According to National Geographic, its weight is between 3,168 and 7,920 tons, though females are significantly smaller. In Africa, 98.8 percent of white rhinos are in South Africa, Namibia, Zimbabwe, and Kenya, according to World Wide Fund for Nature. These countries have tropical and subtropical grasslands, savannas, and shrub lands upon which it feeds on. Compared to black rhinos, white rhinos have a longer skull, less hair, and are bigger. Around 14 female white rhinoceroses with their calves can cluster together, while they are defended by adult males in territories of 1 to 3 square kilometers marked with dung piles. Males competing for females will engage in serious bloody conflicts with their horns. Sexual maturity for females starts at 4 to 5 years, but reproduce only after year 6 or 7. Meanwhile, males begin mating at 10 to 12 years. The white rhinoceros has a lifespan of 40 years according to World Wide Fund for Nature. 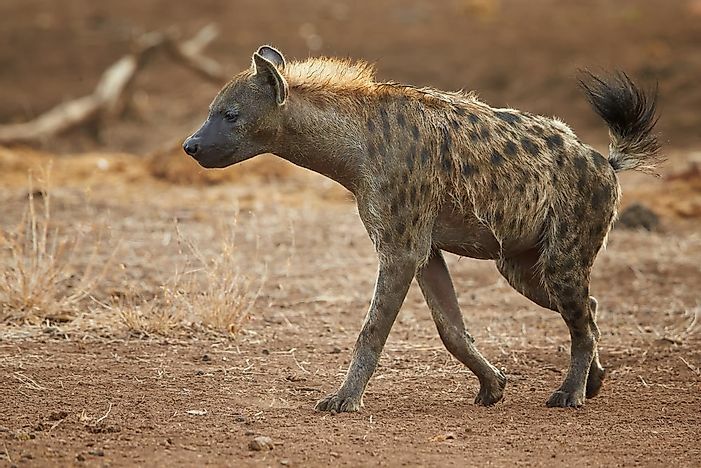 Renowned as a cowardly scavenger, the spotted hyena is a wily hunter with dog-like looks, and is the second largest carnivore in Africa after the lion, according to ARKive Initiative (AI). The spotted hyena weighs from 110 to 190 pounds, its length from head to rump is between 0.86 and 1.5 meters, and its tail is 25 to 36 centimeters according to National Geographic. The spotted hyena's rough fur color is sandy, ginger, dull grey, or brown, with dark spots on its back, rump, and legs that fade with age, according to ARKive Initiative. As a scavenging carnivore, it largely feeds on the carcasses of dead animals. Spotted hyenas can collectively besiege, and bring down, a large wildebeest, as well as antelopes and buffaloes. It has strong jaws that crush heavy bones to obtain the nutritious marrow, but it also eats birds, lizards, snakes, and insects, according to National Geographic. The spotted hyena can ran fast for long distances without tiring, and produces laughter-like sounds. Hyenas live in clans of up to 90 animals that defend their territory. Female hyenas are dominant over males, according to an International Union for the Conservation of Nature hyena specialist group report. The hyena population is predominant in Sub-Saharan Africa, except for the Congo rainforests, according to ARKive Initiative. Kenya, Tanzania, Ethiopia, Botswana, South Africa, and Namibia have the largest spotted hyena populations. These countries have savannas, grasslands, woodlands, and montane forests of up to 4,000 meters in altitude where spotted hyenas inhabit. Sexual maturity is achieved in 2 to 3 years, and it has an average lifespan of up to 25 years in the wild, according to National Geographic. The world’s fastest land mammal is the cheetah. It reaches speeds of 60 miles per hour in as little as three seconds according to National Geographic. It has black and yellow to soft orange spots, and weighs 77 to 143 pounds. The cheetah’s length from head to rump is 1.1 to 1.4 meters, and the tail is 65 to 80 centimeters long. 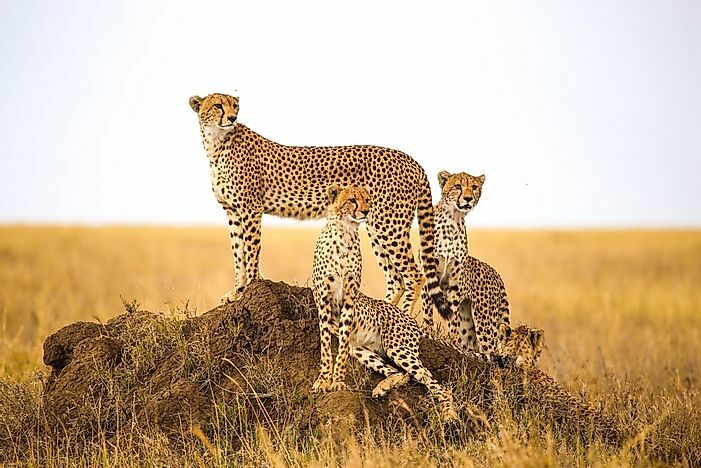 According to Africa Wildlife Foundation, there are about 7,500 of cheetahs left in the wild, inhabiting territories in Eastern and Southern Africa in such countries as Kenya, South Africa, Tanzania, Uganda, and neighboring others. These countries have open tall savanna grasslands and woodlands, which cheetahs rely on for natural camouflage during hunts. These habitats also have gazelles, wildebeest calves, impalas, hares, and smaller hoofed herbivores that are part of the cheetah’s diet. Cheetahs are largely solitary, but at times males from the same litters live in small groups. Females are solitary except when raising cubs. To subdue and kill its prey, the cheetah knocks it down and bites the neck to suffocate it. It purrs like a domestic cat. A cheetah achieves sexual maturity at 20 to 23 months, according to the Cheetah Foundation, and in the wild has an average lifespan of 10 to 12 years.